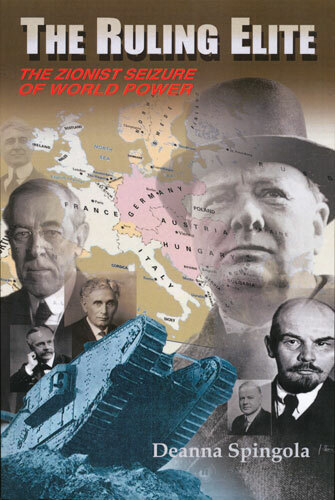 The Ruling Elite—The Zionist Seizure of World Power: This incredible book, by Deanna Spingola (book two of the Ruling Elite series) captures the readers’ imagination with its breathtaking array of facts and evidence. Discover how the Zionist Jews, though a minority, have been able to impose their bloody regime of power and influence across the globe. From President Woodrow Wilson to Franklin D. Roosevelt, the Jews used money and corruption to takeover Washington, D.C. Both the White House and the Congress have become Zionist-controlled fiefdoms. Today, no politician dare fight the awesome power of the Jews. The U.S. Constitution is disrespected and ignored, and Wall Street and its Jewish bankers and corporate chieftains run wild, stealing and rampaging. The media, too, is under Zionist control and we are fed lies and propaganda 24/7. This definitive book explains how this has happened and provides the facts we can use to put our nation back on the pathway to freedom and independence.